Note The effort described below is listed on the updated FlightGear policy/roadmap document  for the 2016 release cycle (respectively 4.x), i.e. can be considered to be "official". High-Level Architecture (HLA) is a general purpose architecture for distributed computer simulation systems. Rather than have the entire simulation within a single executable, the simulation is split into different Federates, which interact with each other by a Run-Time Infrastructure (RTI, a message bus that handles serialization of messages, events and objects), with federates typically running in their own threads/processes and each federate process having access to the full virtual process address space provided by the OS instead of having to share it with other subsystems (i.e. 32 bit platforms may make better use of virtual RAM that way). It provides a robust environment to make the simulator multi-threaded, taking advantage of computers with multiple cores, or indeed running different parts of the simulation on different computers (including even different platforms and operating systems). It allows us to split out parts of the simulator such as AI (by Decoupling the AI Traffic System), the FDM, Nasal scripting  and Renderer from each other and less time-critical sub-systems such as weather so that we can get consistent (and perhaps higher) frame-rates (i.e. reduced Nasal GC impact on frame rate). It provides a very good framework to allow anyone to create components that interact with FlightGear using programming languages other than C/C++ (think Ada, Java, Python etc), which may be running in their own threads, and reside in separate binaries, which will be also easier to debug/troubleshoot (think regression testing, i.e. running a self-contained subsystem in a dedicated gdb/valgrind session), without having to know how to modify/patch and rebuild FlightGear. A good overview of how the HLA architecture works can be found here http://www.pitch.se/images/files/tutorial/TheHLAtutorial.pdf. We intend to use OpenRTI as the underlying RTI. This is an open source IEEE 1516 standard RTI, written by Mathias Fröhlich and available from https://sourceforge.net/projects/openrti/. Mathias has also written an open source toolkit to act as an interface library, with a working name of SimKit. This sits on top of the RTI and simplifies interfacing with the RTI massively. It also has excellent Python integration, making it very easy to write scripted Federates. Using SimKit, the integration point is within the FlightGear code (rather than SimGear), in particular the code under $FG_SRC/Network/HLA. A key part of the design is writing the Federation Object Model (FOM), which defines the objects and updates that are published by the RTI. While it might at first glance seem a good idea to use the FOM to share the internal property tree across multiple federates, this is probably the wrong way to use HLA as the granularity is too low  and it's likely to lead to synchonization issues. Instead, we'll need to make explicit decisions about the data models to communicate. Richard's Emesary system would also probably work quite well with the HLA FOM to give us a way for models to communicate with other models. ↑ stuart (Mar 21st, 2016). Re: HLA . ↑ Stuart Buchanan (Mar 24th, 2016). 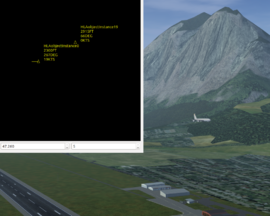 Re: [Flightgear-devel] HLA. ↑ Richard Harrison (Apr 1st, 2016). [Flightgear-devel] Message passing interface for Nasal. Federates can be written in most languages, but SimKit provides very good hooks for writing them in C++ and Python. For some Subsystems split off from the existing FlightGear source, it's fairly easy to create an executable with its own property tree and have shared C++ code to map FOM objects to property values. However, this is an implementation detail - the whole point of HLA and the FOM is that it makes no assumptions about what Federates do with the data. Regarding weather, in a HLA/RTI context the way to do this would be to have a weather engine as an RTI Federate. This would run any required weather simulation, and pass (very) local weather conditions to each of the aircraft/tower/windsock in the simulation, plus publish position information on clouds for use by visualiation engines. Stuart is cautiously optimistic that he may be able to provide the start of a HLA implementation quite soon, as one of the blocking factors may be resolved soon. Currently, there is some very old HLA support in SimGear. This is very out of date and should be ignored. Stuart has HLA support using the latest OpenRTI and SimKit working on a local build, but is waiting for Mathias to officially publish his SimKit before he pushes his changes. So all of the following is local-only, but included here for information. The Flightgear core currently supports HLA as follows. SimKit integration, reading the SimKit FOM and connecting to an OpenRTI RTI. Instantiating MP AI objects so users can view objects published over the RTI by other Federates. This is currently somewhat unsatisfactory as it overloads the MP code, where really these objects are more basic. Pick up Environment Objects for this instance and use them to set the local METAR string for weather generation. fgogel - An AI model written in python the publishes over to the RTI. Part of SimKit, but handy nevertheless! fgmetar - written in python that retrieves the closest METAR station for other published Federates and publishes the METAR for them to pick up. This could be expanded to provide a general Weather Engine. Stuart now has the AI Manager working as an external binary, and publishing updates over the RTI which are displayed as MP Aircraft. Stuart has created a little python script that looks for objects with locations being published over the RTI and publishes the closest METAR to them, then modified FG to pick up the appropriate METAR string for this instance and use it as the real-time input for weather generation. ↑ Stuart Buchanan (Jan 10th, 2017). Re: [Flightgear-devel] Traffic 2020: Towards a new Development Model for FlightGear AI Traffic . ↑ Stuart Buchanan (Feb 23rd, 2016). [Flightgear-devel] HLA Status Update 23/2/2016. FlightGear CIGI Support (Common Image Generator Interface). This page was last modified on 13 January 2017, at 16:51.